This guy from Doncaster, South Yorks is something else, though. He is a real person, yes, and his name is Rob Hull. 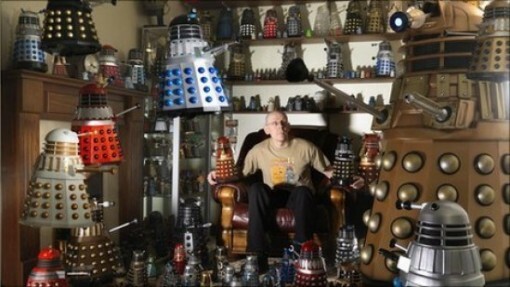 He is something else because he has a ton of Daleks in his possession. And I mean real Daleks that you can see and play with. To be more accurate, he has 571 Daleks, the most impressive of which is a hulking 6-foot long replica. I think that even the Doctor’s eyes would pop out at the sight of that! That’s not all, though. What really makes Rob Hull interesting – or a curiosity for me – is that he does not even like Doctor Who. No, he does not watch the show! The only reason he got into collection Daleks, he says, is that he saw one at a toy store when he was a kid. His mum wouldn’t get it for him, and he promised himself he’ll get one for himself one day. That promise has turned out to be a 20-year long collection obsession, which has now landed him a spot in the 2012 Guinness Book of Records. Not bad for someone who does not follow the show, don’t you think? I am no fan of the Daleks – I find them rather irritating, don’t you? – but having a collection like Hull’s is nothing to scoff at. I actually find it quite admirable. I am sure Hull’s wife, who says she hates the bloody things, will disagree though.